Review of Scientific Instruments, 88 , pp. 094702, 2017. The performance of digital-to-analog converters is principally limited by errors in the output voltage levels. Such errors are known as element mismatch and are quantified by the integral non-linearity. Element mismatch limits the achievable accuracy and resolution in high-precision applications as it causes gain and offset error, as well as harmonic distortion. In this article, five existing methods for mitigating the effects of element mismatch are compared: physical level calibration, dynamic element matching, noise-shaping with digital calibration, large periodic high-frequency dithering, and large stochastic high-pass dithering. These methods are suitable for improving accuracy when using digital-to-analog converters that use multiple discrete output levels to reconstruct time-varying signals. The methods improve linearity and therefore reduce harmonic distortion, and can be retrofitted to existing systems with minor hardware variations. The performance of each method is compared theoretically and confirmed by simulations and experiments. Experimental results demonstrate that three of the five methods provide significant improvements in the resolution and accuracy when applied to a general-purpose digital-to-analog converter. As such, these methods can directly improve performance in a wide range of applications including nanopositioning, metrology, and optics. IEEE Transactions on Circuits and Systems I, 64 (6), pp. 1409-1420, 2017, ISBN: 1549-8328. A new method for reducing harmonic distortion due to element mismatch in digital-to-analog converters is described. This is achieved by using a large high-frequency periodic dither. The reduction in non-linearity is due to the smoothing effect this dither has on the non-linearity, which is only dependent on the amplitude distribution function of the dither. Since the high-frequency dither is unwanted on the output on the digital-to-analog converter, the dither is removed by an output filter. 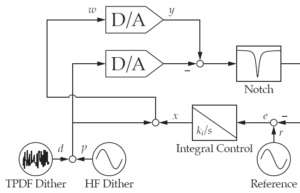 The fundamental frequency component of the dither is attenuated by a passive notch filter and the remaining fundamental component and harmonic components are attenuated by the low-pass reconstruction filter. Two methods that further improve performance are also presented. By reproducing the dither on a second channel and subtracting it using a differential amplifier, additional dither attenuation is achieved; and by averaging several channels, the noise-floor of the output is improved. 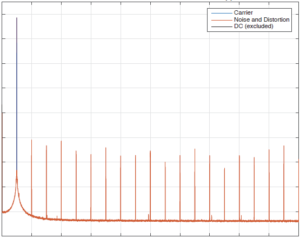 Experimental results demonstrate more than 10 dB improvement in the signal-to-noise-and-distortion ratio. IEEE Conference on Decision and Control, Las Vegas, NV, 2016. The resolution of precision mechatronic systems is fundamentally limited by the the noise and distortion performance of digital-to-analog converters. The sources of noise and distortion include quantization error, non-linearity, thermal noise, and semiconductor noise. In precision control applications, the primary limitation is harmonic distortion due to quantization and element mismatch. In this article, quantization noise and harmonic distortion are reduced by combinations of small noise dithers and large high-frequency periodic dithers. Theoretical predictions are confirmed experimentally on a closed-loop nanopositioning system. The results show reasonable correspondence to simulation and a significant reduction in noise due to quantization and element mismatch. Australian Control Conference, Newcastle, Australia, 2016. 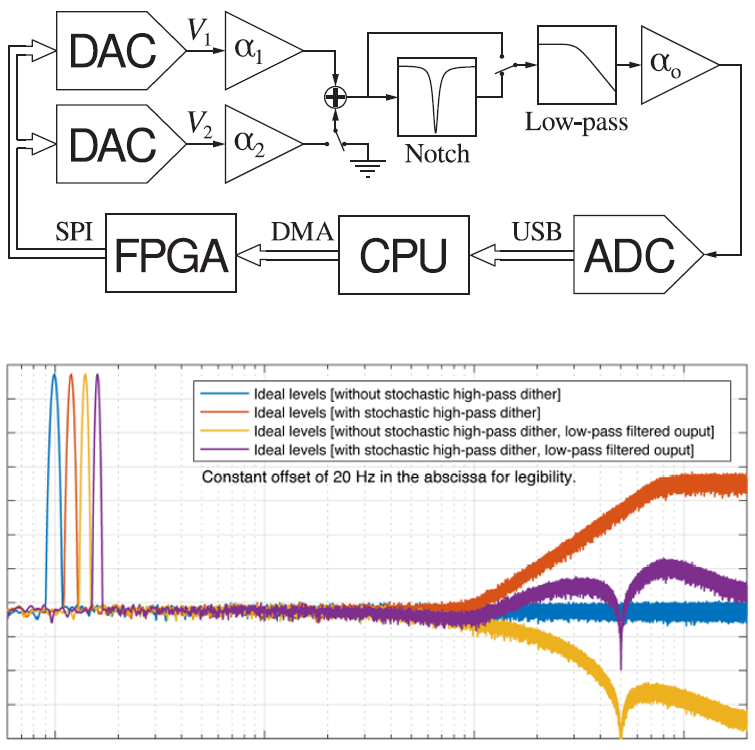 An experimental assessment of some state-of-the-art commercially available digital-to-analog converters (DACs) is presented. A DAC is the principal enabling device for implementing modern digital feed-forward and feedback control. For precision mechatronic systems employing the best available instrumentation, the main limitation to resolution is presently the noise and distortion performance of DACs. 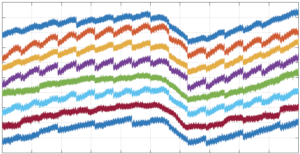 The paper focuses on measuring the dynamic performance of the DACs, that is, the maximum resolution that can be achieved in practice when using the DACs for trajectory tracking, as well as the time-delay introduced due to DAC latency.